Most of us have turned to a cup of tea, hot chocolate or warm honey and lemon at some point while feeling under the weather, but what's the science behind hot drinks, and do they really help us beat a cold or flu? 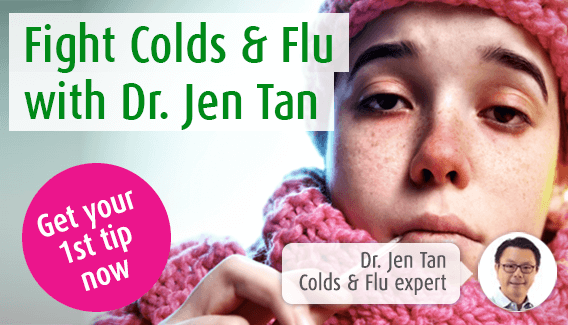 I discuss some of the research behind using hot drinks as a cold and flu remedy. A hot mug of tea has been used to give the British people all sorts of comfort for many centuries. Today, with a wide choice of herb teas and different types of coffee, including fruit coffees, the hot drinks we use may be different from that in Gladstone’s day. But, they still play a very big part in our daily lives as well as when we feel a bit ‘under the weather’. So, why is a good hot cup of tea so reviving? First, it slows you down. Although we have all tried, it is difficult to gulp down a mug of steaming hot beverage without harming oneself. This makes you more inclined to sit down and take a bit of time for yourself. Having a break from your normal (stressful) routine also makes you feel more relaxed and, as Gladstone said, more cheerful. Research has shown that this effect is powerful enough to change the way you feel towards the people around you.Scientists in the US found that holding a cup of hot coffee made one feel friendlier to someone you have just met, compared to holding a cup of iced coffee. Warmth is associated with safety, so perhaps this is not surprising. However, researchers suggest that the effects go beyond the psychological as warm sensations activated a part of the brain where judgements occur, making us less critical. Perhaps this is the reason that tea parties were invented? Hot drinks have also been used by many for their simple therapeutic effects. For instance, when coming down with a the common cold or flu, a warming drink can help you find relief from symptoms such as coughs, runny noses, sore throat or if you are feeling a bit shivery or feverish. This is one reason why many people reach out for some of the popular sachets to make hot drinks containing painkillers such as aspirin and paracetamol. Ron Eccles, a Professor at Cardiff University and the Head of the Common Cold Centre, suggested that the use of hot drinks had the effect of reducing pain levels and the need to cough. This was particularly so for sweet hot drinks as endorphins are released from the brain stem and this effect alone could explain why they can make one feel better. Prof Eccles was the researcher who lead the largest clinical trial on Echinacea a few years ago. The study, involving over 750 people over a period of 4 months, found that the use of extracts of freshly harvested Echinacea reduced the risk of picking up colds and flu, especially in those at risk of these infections such as people who are under stress, poor sleepers and smokers. The extract used in this research comes in the form of Echinaforce® – it is known for its ability to strengthen the body’s immune system and treat the symptoms of colds and flu. Made from both Echinacea herb and root, it has become a popular herbal remedy in many parts of the world. The same Echinacea extract can now be found in the Echinaforce® Hot Drink, which also contains concentrated Elderberry (Sambucus) juice. So, with this, you have at your disposal, a well-established treatment for colds and flu and the benefits of a hot drink to bring you more comfort and relief. Useful to have around if you are unfortunate enough to end up with a bad cold or flu.